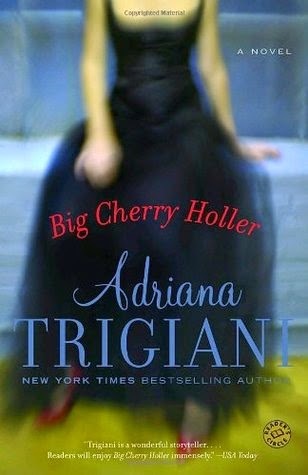 BIG CHERRY HOLLER, the extraordinary sequel to BIG STONE GAP, takes us back to the mountain life that enchanted us in Adriana Trigiani’s best selling debut novel. It’s been eight years since the town pharmacist and long time spinster Ave Maria Mulligan married coal miner Jack MacChesney. With her new found belief in love and its possibilities, Ave Maria makes a life for herself and her growing family, hoping that her fearless leap into commitment will make happiness stay. What she didn’t count on was that fate, life, and the ghosts of the past would come to haunt her and, eventually, test the love she has for her husband. The mountain walls that have protected her all of her life can not spare Ave Maria the life lessons she must learn. BIG CHERRY HOLLER is the story of a marriage, revealing the deep secrets, the power struggle, the betrayal and the unmet expectations that exist between husband and wife. It is the story of a community that must reinvent itself as it comes to grips with the decline of the coal mining industry. It is the story of an extended family, the people of Big Stone Gap, who are there for one another especially when times are tough—including bookmobile librarian and sexpert Iva Lou Wade Makin, savvy businesswoman Pearl Grimes, crusty cashier Fleeta Mullins, and Rescue Squad captain Spec Broadwater, who faces the complications of his double life. Ave Maria’s best friend Theodore Tipton, now band director at the University of Tennessee, continues to be her chief counselor and conscience as he reaches the pinnacle of marching band success. When Ave Maria takes her daughter to Italy for the summer, she meets a handsome stranger who offers her a life beyond the Blue Ridge Mountains. Ave Maria is forced to confront what is truly important: to her, to her marriage, and to her family. Brimming with humor, wisdom, honesty, and the drama and local color of mountain life from Virginia to Italy, BIG CHERRY HOLLER is a deeply felt, brilliantly evoked story of two lovers who have lost their way and their struggle to find one another again. This is one of those times that I really want to use half stars again. I enjoyed the first book, Big Stone Gap, quite a bit and gave it 4 stars. However, I enjoyed this book more and, to me it is almost (but not quite) in the 5 star category. So, in my heart, this is a 4.5 star book. While Big Stone Gap was a book about a love story, it did wade at least knee-level into the waters of self-acceptance. Big Cherry Holler dives right into that pool. In many ways, it is the story of what comes after "happily ever after," something that I can really appreciate. While there is quite a bit going on in this book, it really centers around Ave Maria and her marriage to Jack Mac. They are 8 years in, a time when many marriages struggle. Now, add to that the fact that they are dealing with the death of their son (this comes up in the first chapter, so I'm not considering it a spoiler!) a few years prior. That is a huge mine field for couples and many marriages do not survive such a tragedy. Then, to top it off, Ave Maria is still dealing with the "self work" she started in Big Stone Gap. I love Ave Maria more in this book than I did in the first--even though I wanted to shake her several times during this book. But she's human and just the sort of person I'd want as a friend--and I'd want to have her friends, as she has the most entertaining social circle around. I will say it was stressful to read about the issues in her marriage, but when is that not stressful? I do wish that Trigiani had delved a bit more into Jack Mac's side of things--after all, it takes 2 to tango and it almost seemed like Ave Maria was doing a solo out there. But, this book is ultimately about Ave Maria so that isn't bothering me as much as it might in another book. I also wish that Trigiani had either amplified or muted some of the little side stories. They were interesting, but there wasn't enough in there for me to really sink my teeth into. I think if she had either fleshed them out, or got rid of them completely, it would have improved the book. All in all, I loved this book enough to spend surprising little time on the drawbacks. It's a story about real life, and that I can appreciate.